Since I talk a lot about fair odds and value wagering, I thought I would spend some time this week explaining how to bet in a value-conscious manner. Now, there are two ways to approach value betting. The first is to establish a fair odds line that is reasonably reliable. Remember, if your fair odds do not adequately reflect reality they are pointless. In other words, if a horse that you make 3-1 doesn’t win approximately one out of every four times it runs, 3-1 is not its fair price. Consequently, producing a fair odds line is not easy. In fact, it is my contention that the vast majority of horseplayers will only be able to do so in very specific situations. But that’s OK. After all, one shouldn’t be betting every race anyway. Once the fair odds are established, the next step is simple: Just bet on the horse or horses going to post at odds equal to or greater than their fair odds. Obviously, on-track patrons should try to wait until the last possible instant to bet in order to ensure that the fair price is met or exceeded; those betting through TwinSpires or other such outlets, however, can place what’s known as a conditional wager and avoid the stress of last-minute number-punching. A conditional wager allows bettors to set a minimum price that must be met at a designated time prior to post. For example, the graphic below shows a $20 conditional win bet on 3-Luce Mia in the first race at Turfway Park on Dec. 7. The bet was placed using the TwinSpires “Classic” betting interface and requires that Luce Mia be 6-5 or greater at zero minutes to post (see the “Min Odds” and “MTP” boxes below). Although this was a mythical bet, I picked this race on purpose to demonstrate both the advantages and the disadvantages of conditional wagering. Had this bet been placed, it would have filled… yet Luce Mia went off at 4-5. How can this be? Well, it’s because with zero minutes to post, Luce Mia’s odds were hovering in the 7-5 to 8-5 range and that is when the decision was made to bet or not to bet. 1) If the horse one prefers is the morning-line favorite, double the fair odds at small tracks; add 50 percent to the fair odds at larger tracks. 2) If the horse one prefers is not the morning-line favorite, but is 3-1 or less on the morning line, add 25 percent to the fair odds. 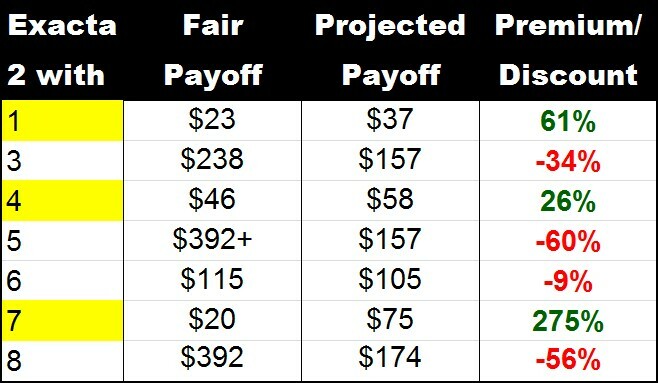 NOTE: The reason for these adjustments is that, for the most part, late money comes in on favorites and near-favorites. This boosting of the fair odds is an attempt to counter that. Thus, in the example above, the 6-5 fair odds on Luce Mia would have been changed to 9-5, as she was the 2-1 morning line favorite (1.2 + 50 percent = 1.8 or 9/5). The second way to get bang for one’s buck is to look for value in the exacta. This can be done in two ways: 1) By using fair odds to determine what the expected payoffs should be and wagering on combinations offering a premium; or 2) By using the actual tote odds and doing exactly the same thing. 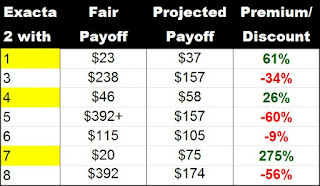 Below is a chart that gives the fair $2 payoff for various odds combinations (based on a 120 percent win pool). The predicted winner’s odds are in the far left column, while the odds on the predicted place horse are listed in the second row. To obtain the fair payoff for a particular combo, simply find where the winner’s odds and the second-place finisher’s odds intersect. Assuming you liked the eventual winner, 2-Smoknintheboyzroom, there were three exacta combinations that were offering value based on the post-time odds. The 2-1 combo was paying $37, yet the fair price was $23; the 2-4 coupling was worth $58 ($46 was fair); and the 2-7 was offering $75 ($20 was fair). The race finished 2-4, with the exacta returning an even $58. Of course, this method for finding value in exactas is not foolproof — clearly some horses have a better chance of finishing second than they do of winning and vice versa — but it’s a good starting point. And it’s especially effective at smaller tracks like Scarborough where the exotics pools are not always efficient. Now, just for the fun of it, let’s take a look at an upcoming race to see the entire process at work. The eighth event at Aqueduct has a 90 percent Race Rating according to my Win Factor Report and, thus, the computerized fair odds listed therein are deemed to be reliable. So, our conditional wagers are pretty straightforward. With San Pablo the morning line favorite, we set our fair win odds at 4-5 (0.6 + 50 percent = 0.9 or 4/5). Then, when the tote odds are available, we’ll set our fair exacta odds (or we can use the $1 prices listed in my Win Factor Report). Try using the value betting approach on other races this weekend. I think you’ll find it to be a powerful money management technique. This is a very good website. Thank you for this post. a href=" http://www.stakemate.com/" Social betting aCreate your own betsa href=" http://www.stakemate.com/" Fun betting /a Create my own bets,a href="http://www.stakemate.com/"Betting for fun/aSocial betting, Create your own bets, Fun betting, betting for fun, Bet tracker,bet-tracker. Stakemate is a social betting platform, where the users are the bookmakers and their friends and everyone else are the pundits. No money is involved. Only respect at stake.Bet on everything. The weather, sports, the night out, politics etc. Select an opponent among your friends and determine: - Your win chance (in percentages) - What's at stake? (points) - When is the bet stop for your opponent and 3rd parties, who wants to bet on the outcome of your bet? - Should the bet be visible to everyone, only your network or perhaps just you and your opponent? - What's at stake for people joining the bet as 3rd party? As an opponent you have the opportunity to counter the bet, before you accept. This is a very good website. Thank you for this post. Social betting, Create your own bets, Fun betting, betting for fun, Bet tracker,bet-tracker. Stakemate is a social betting platform, where the users are the bookmakers and their friends and everyone else are the pundits. No money is involved. Only respect at stake.Bet on everything. The weather, sports, the night out, politics etc. Select an opponent among your friends and determine: - Your win chance (in percentages) - What's at stake? (points) - When is the bet stop for your opponent and 3rd parties, who wants to bet on the outcome of your bet? - Should the bet be visible to everyone, only your network or perhaps just you and your opponent? - What's at stake for people joining the bet as 3rd party? As an opponent you have the opportunity to counter the bet, before you accept. Actually this is first class website. It is very helpful. Social betting, Create your own bets, Fun betting, betting for fun, Bet tracker,bet-tracker. Stakemate is a social betting platform, where the users are the bookmakers and their friends and everyone else are the pundits. No money is involved. Only respect at stake.Bet on everything. The weather, sports, the night out, politics etc. Select an opponent among your friends and determine: - Your win chance (in percentages) - What's at stake? (points) - When is the bet stop for your opponent and 3rd parties, who wants to bet on the outcome of your bet? - Should the bet be visible to everyone, only your network or perhaps just you and your opponent? - What's at stake for people joining the bet as 3rd party? As an opponent you have the opportunity to counter the bet, before you accept. Effectively this is first class website. It is very supportive. Create your own Stakemate is a social betting platform, where the users are the bookmakers and their friends and everyone else are the pundits. No money is involved. Only respect at stake.Bet on everything. The weather, sports, the night out, politics etc. E Stakemate is a social betting platform, where the users are the bookmakers and their friends and everyone else are the pundits. No money is involved. Only respect at stake.Bet on everything. The weather, sports, the night out, politics etc. 12 MTP with TwinSpires, $10 Exacta box with 5,6,7, the screens says "Thanks for placing your Wager", 12 MTP? Why is TwinSpires not paying my winner?